and diamonds, ca. 17th century. There was a bit more buzz than usual at the “Royal Treasures from the Louvre” press conference and preview. When San Francisco Mayor Ed Lee took a seat, the room quieted, and Dede Wilsey, president of the board of trustees for the Fine Arts Museums of San Francisco, spoke at the podium. She announced an exclusive five-year arrangement between the San Francisco Fine Arts Museums and the Museé du Louvre, in which the two institutions will work together on a series of exclusive exhibitions and exchanges. The agreement includes plans to share significant works of art from both museums’ collections. Lee proudly spoke about Paris being a new sister city to San Francisco and his desire to continue to make San Francisco an international center. Then Wilsey and Henri Loyrette, the president-director of the Museé du Louvre, signed the accord, followed by big applause all the way around. The new exhibit, “Royal Treasures from the Louvre: Louis XIV to Marie-Antoinette” is an “amuse – bouche,” a bite-sized hors d’œuvre to whet our appetite for the French antiquities, paintings, sculpture, decorative arts, prints, drawings, textiles, publications and public education programs to come. 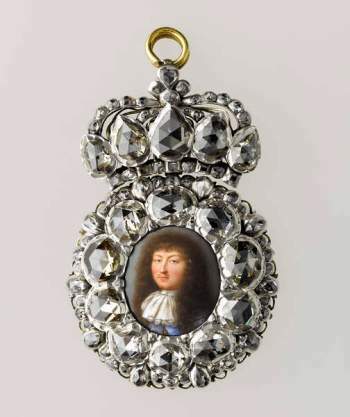 The show contains highly decorated objects from the reign of Louis XIV (1638 – 1715) until the French Revolution (1789). Elaborate pieces made of gold, diamonds, semi-precious stones, silver, Sèvres porcelain, silk, Venetian glass and hardstones fill the exhibition rooms. Many have never left France before; and San Francisco is the only venue for this exhibit. Highlights include the precious hardstone vases collected by Louis XIV (such as the lapis lazuli vase at right, attributed to François Roberday, ca. 1680; ©RMN-Grand Palais/Art Resource NY/Jean-Gilles Berizzi). He acquired antique, Byzantine, medieval, and oriental hard-stones vases, to which have been added sixteenth and seventeenth century bejeweled ornamentation by the great jewelry houses of Milan, Prague, and Germany. In other words, the original vases were not deemed by Louis XIV to have enough bling without being reworked with additional jewelry trim and mounts. They are quite beautiful and decorative, as befits the Sun King. Don’t miss the intricate and ornate group of snuffboxes, some made of diamonds and gems, others of enamel and porcelain with painted artistic scenes, which were given by the royal family as diplomatic gifts. Many exquisite items in the exhibit, from silk tapestries to an impressive mosaic tabletop of semiprecious stones, were made in the Gobelins workshop, a tapestry factory where Flemish dye- and tapestry-makers produced works for royal clients. Louis XIV later decreed that the enterprise should become a general upholstery factory where furniture as well as tapestries were made. The Gobelins’ building, located at 42 avenue des Gobelins in Paris, is managed today by the French Ministry of Culture and open for guided tours by appointment. There has been much interest in French royalty over the last few years, especially Marie Antoinette. The San Francisco Legion of Honor’s 2007-2008 exhibit, “Marie-Antoinette and the Petit Trianon at Versailles,” was an exceptional exhibit of the Trianon’s lovely art and furnishings as well as an exploration of the truth behind the legend of Marie-Antoinette. An enthralling 2012 film, “Farewell My Queen,” takes place during the final few days before the 1789 French Revolution caught up with Marie Antoinette. “Royal Treasures from the Louvre: Louis XIV to Marie-Antoinette” is an amazing collection of elaborately decorated objects and furniture. This “amuse-bouche”is a delectable treat, but we anticipate with pleasure the feast of more of the Louvre’s exceptional art coming to San Francisco. By Emily S. Mendelemilymendel@gmail.com©Emily S. Mendel 2012 All Rights Reserved.